A twisted ankle can be caused by one little misstep. Sports, walking down steps, icy surfaces can all cause someone to take the wrong step and twist their ankle. 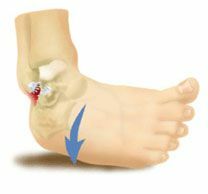 Usually a sprained ankle can heal safely without much need for treatment other then to take it slow and apply some RICE- rest, ice, compression, elevation. Sprained ankles are more serious and often involves torn ligaments. A sprained ankle is caused when someone's foot is planted into the ground and their ankle rolls out. A sprained ankle very painful! The ankle will swell up and become bruised almost immediately. Often, a sprained ankle can heal with the same methods as a twisted ankle, however, in severe cases surgery may be needed. As soon as you injure your foot or ankle, you need to see a doctor immediately. Getting the ankle checked out quickly will ensure the best outcome. The sooner you get it checked out, the faster you may be able to begin healing.